This is a special edition of a Wageningen University Working Papers in Evolutionary Governance Theory (EGT). Education in planning and design, as a broad field of related disciplines and professions, like land-scape architecture, spatial planning, urban planning and design, and environmental governance en-compasses scientific and practical dimensions (Van Assche et al., 2013, Goldstein and Carmin, 2006; Friedmann, 1996). Most of the educational programs in Europe and the United States focus on train-ing students aiming to actually work in planning and design practices. Yet, the nature of those prac-tices and by extension those of the related disciplines, has been questioned continuously (Sandercock, 1997). In landscape architecture, there is the eternal debate on design, at the cross-roads of art and science (Van Assche et al., 2013, Gunder, 2011, Bannister, 1947, Hunt, 2002, Swaffield, 2002, Blake, 1999). In planning the quest for rational steering and control have become object of severe criticism (Van Assche and Verschraegen, 2008, Allmendinger, 2002, Flyvbjerg, 1998, Gunder and Hillier, 2010, Beunen et al., 2009). These issues are reflected in the development and organization of curricula. Each planning or design program can be interpreted as a set of negotiated positions in on-going debates on the nature of planning and design and a perspective on the role of these disciplines in society. The past decades brought major changes in planning and design practices as well as in the sci-entific reflection on these practices (Van Assche et al., 2014). There is overall tendency in which planning and design processes are organized with more attention to participation and deliberation (Bevir, 2004; Beunen and Opdam, 2011; Mannigel, 2008; Fischer, 2009; Van Assche et al., 2011b). These shifts in governance are strongly intertwined with the contemporary debates about the role of science and expertise in society and the shift noticeable here (Beunen et al., 2012; Herrnstein-Smith, 2005 Fischer, 2000; McNie, 2007; Ellis and Waterton, 2005; Duineveld, 2008). Within the planning and design disciplines, the positivist belief in objective, value free knowledge enabling governmental actors to steer spatial organization, is gradually replaced by approaches in which planning and design processes and practices themselves have become objects of scientific investigation (Van Assche et al., 2012b; Flyvbjerg and Richardson, 2002; Flyvbjerg, 2002; Hillier, 2002; Allmendinger, 2001; Fischer, 2000; Duineveld et al., 2013; Nowotny et al., 2001). These changes bring along particular challenges for those who have to formulate curricula and courses in these disciplines. They should find ways to accommodate the new insights, and try to envision the consequences for the training of future practitioners. The reasons to change curricula are not limited to profession and discipline- specific transitions. One of the most important challenges is that curricula increasingly need to meet standardized academic criteria, without getting totally detached from planning and design practice (cf. Keeling, 2006; Lock and Lorenz, 2007). We argue that planning and design cannot tackle these issues without a deeper and more sys-tematic self-reflection, a reflection on the disciplines, their teaching approaches, and on the role of planners and designers in society. In this paper we will show how research and outreach can play a transformative role in the development and delivery of planning and design curricula. Education, we argue, can be a primary site of rejuvenation of the disciplines. In order to confront the issues at hand, the disciplines will have to rethink a number of relationships, and reflexivity can be a powerful tool in this endeavour. 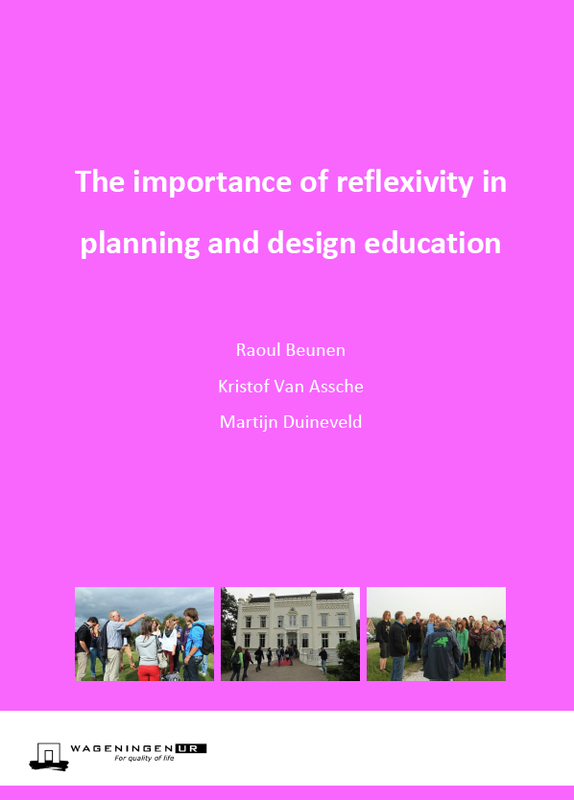 A stronger focus on reflexivity in planning and design education is desirable be-cause this can contribute to the sharper delineation of art, science, and mere accepted practice. Reflexivity, in other words, we deem essential in a remaking of planning and design, that can in-crease the innovative capacity and adaptive potential of both disciplines and professions.